Step 1: Port placement: A 10-mm trocar is placed at the umbilicus, and the abdominal cavity is insufflated to a pressure of 15 mmHg. The camera is also inserted through this larger trocar. A 5-mm trocar is placed at the suprapubis, and a second 5-mm trocar is placed at the LLQ. Step 2: Inspect abdominal cavity: The area is inspected to orient the surgeon to the position of the appendix. Step 3: Expose appendix: The bowel is gently retracted rostrally using atraumatic graspers to allow access to appendix. Step 4: Locate and separate appendicular artery: The mesoappendix is separated from the body of the appendix, and the mesenteric fat is separated to reveal the appendicular artery. This is best done using the “spreader” action of a dissector. Step 5: Divide appendix from cecum: Using an endoloop, two loops are placed proximal to the cecum, and a third loop is placed 1-2 cm distally to these. 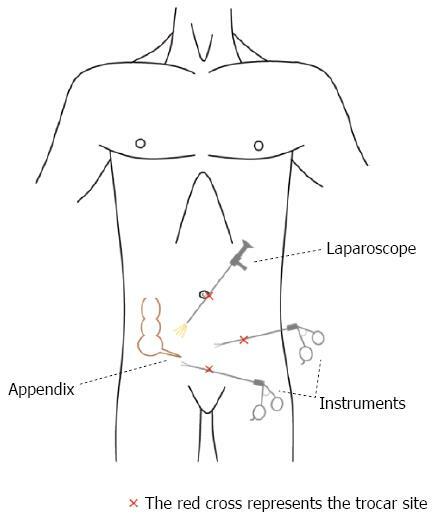 The appendix is then divided between the two proximal and 3rd distal loops using scissors or cautery. Step 8: Irrigate: The abdominal cavity should be irrigated thoroughly with sterile saline and suctioned clean several times. In the event of a rupture, great care should be taken to ensure all pus or other infectious fluids have been removed. Step 9: Final inspection: The abdominal and pelvic cavities are inspected one final time for any signs of infection, errors, or other potential complications.